New! 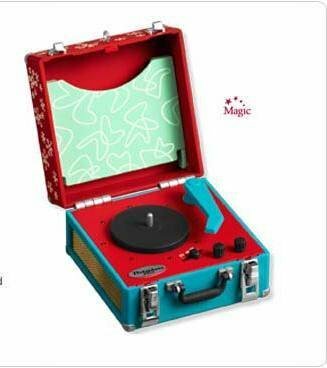 HALLMARK 2008 CLUB MEMBERS EXCLUSIVE ORNAMENT COOL YULE RECORD PLAYER ~ LIGHTS & MUSIC ~ Listen to three different holiday classics--Jingle Bells, We Wish You a Merry Christmas and Jolly Old St. Nicholas done in a cool jazzy style. Select 1 of 3 records, place it on the turntable, and then move the arm over the record to hear the song. Lights will flash around the turntable to simulate spinning motion. VERY limited, & ONLY for Hallmark Ornament CLUB MEMBERS. 1.375" x 2.375" x 3"
Items Similar To "New! 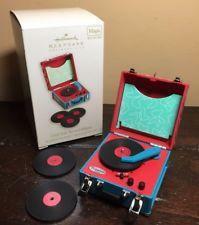 2008 Hallmark COOL YULE RECORD PLAYER~Club Exclusive MAGIC O..."